Carousel, Splash Fountain, Beer Garden, Art, & More! 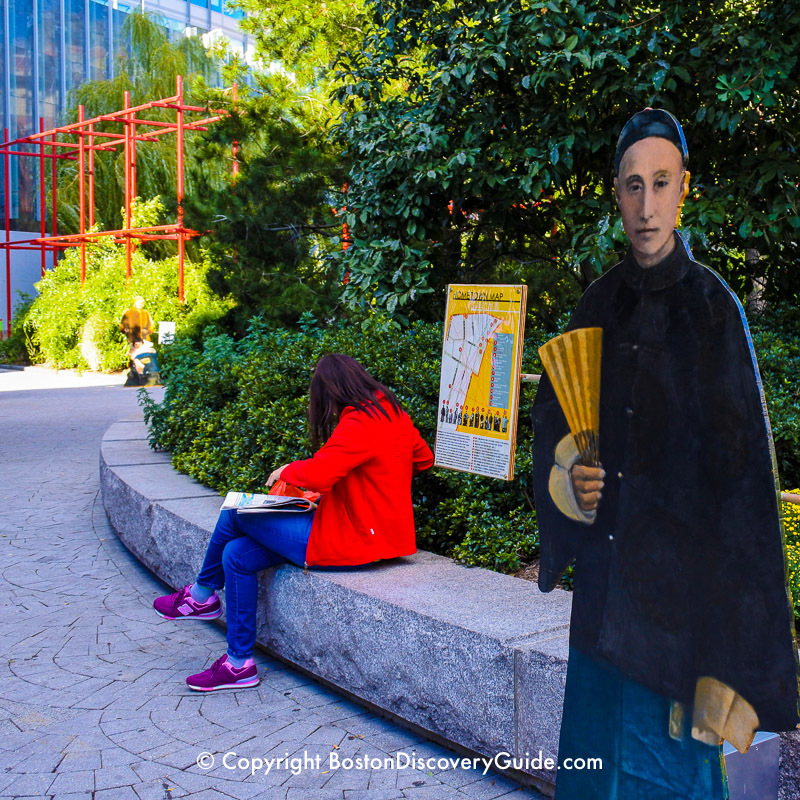 The spectacular Rose Kennedy Greenway, Boston's newest park, stretches from TD Garden and the North End to Chinatown and replaces the former "Central Artery," an elevated highway that slashed through the heart of the city for almost 50 years. 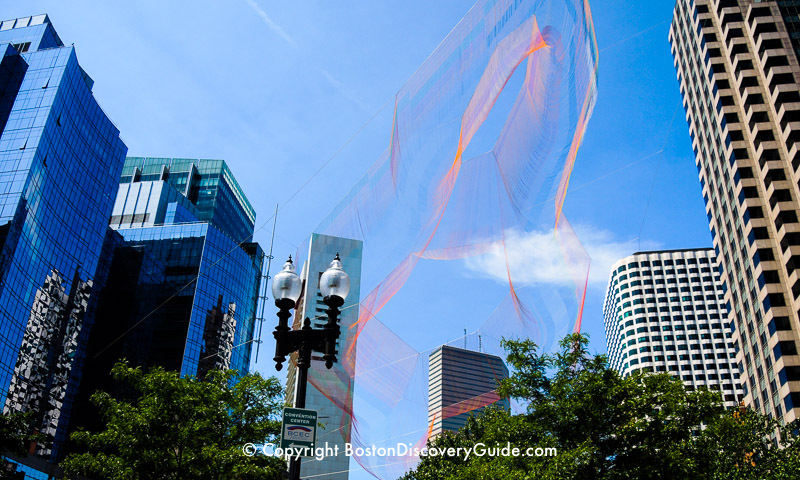 Stretching a mile and a half in length and shaped like a wavy narrow ribbon linking Downtown and the Waterfront, the Greenway's series of linked parks host a huge variety of attractions, events, and revolving art exhibits. 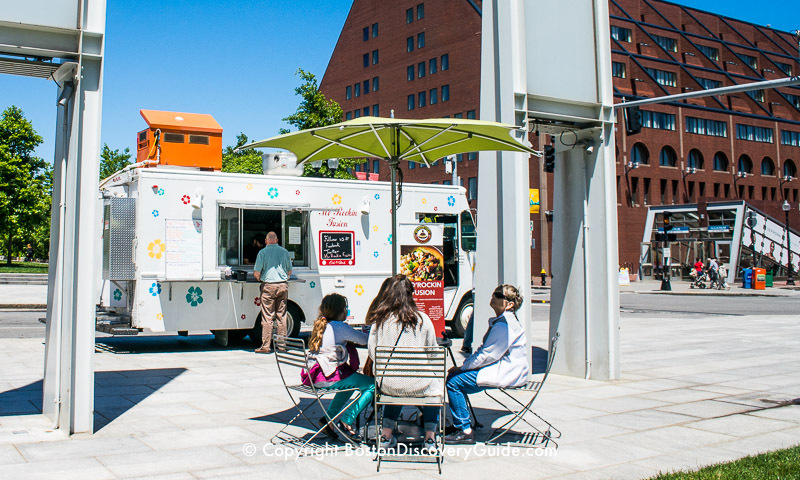 Gardens, festivals, sculpture, memorials to Boston's neighborhoods, and a great selection of Boston's popular food trucks draw crowds throughout the week and weekends. A carousel, grassy fields used for frisbee matches and picnics, and a splash fountain provide a lot of entertainment for visitors of all ages. Art installations, seasonal attractions such as ziplines and a outdoor beer garden, weekly markets, and special events mean you'll almost always find something interesting to see and do. It's become hard to remember that an ugly elevated highway called the Central Artery once dominated this space by slashing through the heart of the city for almost 50 years. 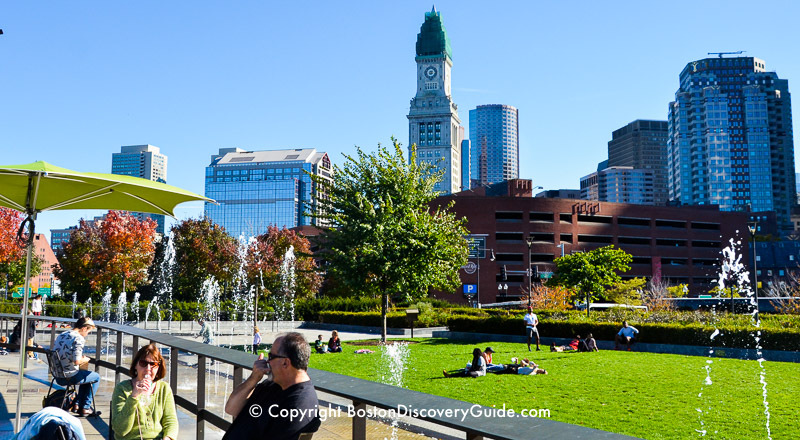 Today, the Greenway is where residents and visitors come together to relax, have fun, and soak up the special ambiance that makes Boston the country's most enjoyable city. The unique 36-seat Greenway Carousel features 14 different Boston creatures from the sea, land, and sky for you to ride on. Choose a lobster, butterfly, whale, harbor seal, grasshopper, or any of the other choices and go for a fun spin. 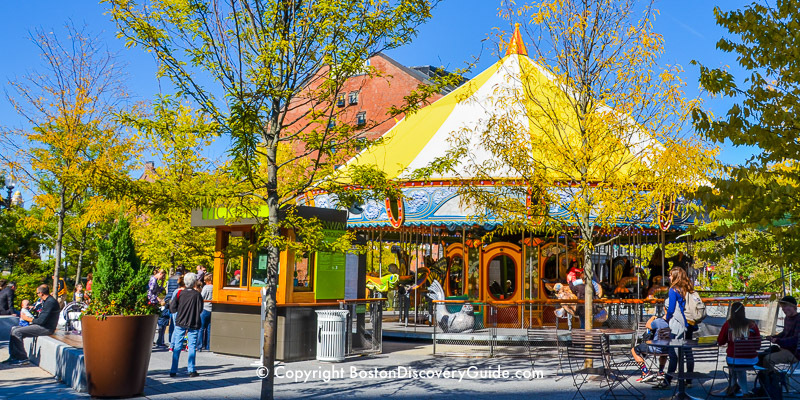 Look for the colorful carousel between the Armenian Heritage Park to the north, and the Boston Harbor Islands Pavilion to the south, with Faneuil Marketplace to the west and Christopher Columbus Park on the east. The Carousel opens in March and closes for the winter in late November. Check our March Events Calendar for the exact opening date. Looking for a way to cool off on a hot summer day? 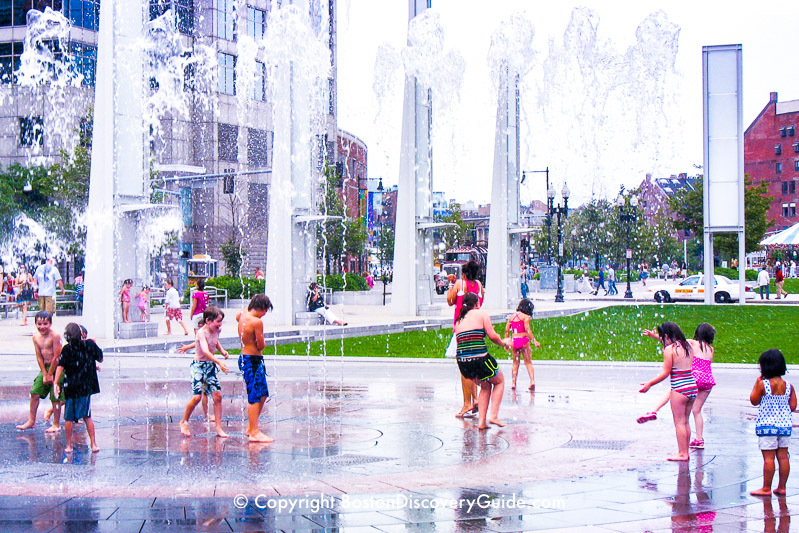 Head straight to the Rings Fountain in the Wharf District Parks section (roughly across from Faneuil Marketplace) where you can splash under the cooling waters of the fountain's multiple jets. True, you'll mostly see kids there - but plenty of adults take a quick turn there as well, so don't hesitate if you feel tempted. Very young kids may prefer the smaller, gentler water sprays in the Canal Fountains stretching along the sides of the North End Parks next to the trellis-covered seating area. An even smaller fountain can be found in the middle of the Labyrinth in the Armenian Heritage Park. It's really there to produce soothing bubbly sounds in this peaceful oasis, but it can work well if you need to cool your feet on a hot day. However, the large black geometrically-shaped granite sculpture with water cascading down its sides is NOT meant for wading or climbing - the only water feature on the Greenway that's off-limits. Another popular wading spot is the Chinatown Stream in the Chinatown Park on the south end of the Greenway. The strategically placed boulders make navigating it a little tricky, so use caution. Finally, if you want to cool off but not get wet, head to the area with the three vertical stainless steel Harbor Fog Sculptures in the Wharf District Parks. 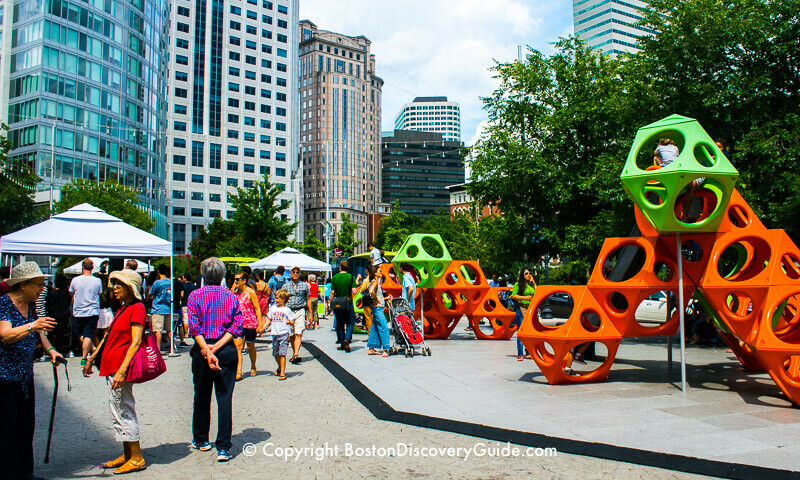 They represent Boston Harbor navigational buoys and are surrounded by large granite blocks recycled from seawalls. The whole area is motion-sensitive - so if you walk nearby, you'll activate the sculptures and they will release clouds of fog, harbor-like sounds, and at night, purple lights from LEDs. 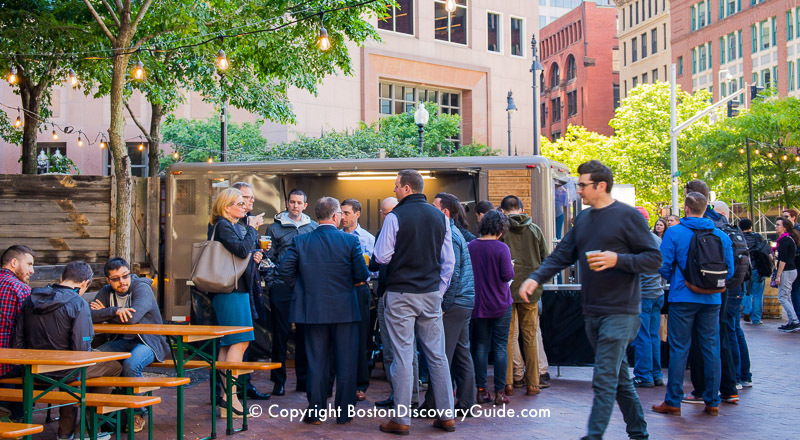 From early May through late October, stop by Trillium Beer Garden on the Greenway across from the Boston Harbor Hotel and raise a glass to whatever you'd like to cheer. Boston's first open-air beer garden serves up a rotating selection of 8 ales, IPAs, wilds, dark beers, and New England farmhouse styles along with 3 wines on tap from Westport Rivers Vineyard. No food is served but you can bring your own - perhaps from the food trucks parked nearby. 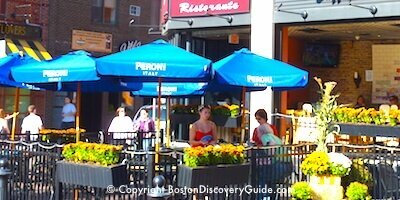 With strings of lights overhead and casual picnic table seating, the beer garden accommodates about 250 people and provides the perfect place to enjoy Boston's balmy weather. Open from 4pm-10pm Wednesday-Friday and 11am-10pm on weekends through October. Love the beer and want more? You can buy it by the case or growler at Trilliam's headquarters a few blocks away in Fort Point. 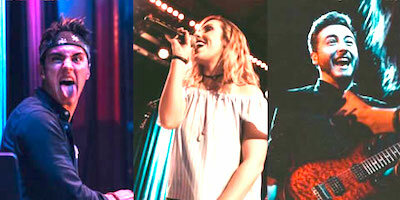 Different musicians from Berklee College of Music perform free concerts featuring jazz, rock, folk, soul, groove, and/or pop each Friday evenings at 5pm in the North End Park (Hanover Street). The concerts run from July through mid-September. Every Saturday and the 1st and 3rd Sundays from May through October in the Wharf District Parks (near the Rings Fountain). You'll find art and finely crafted products from local and New England artisans. 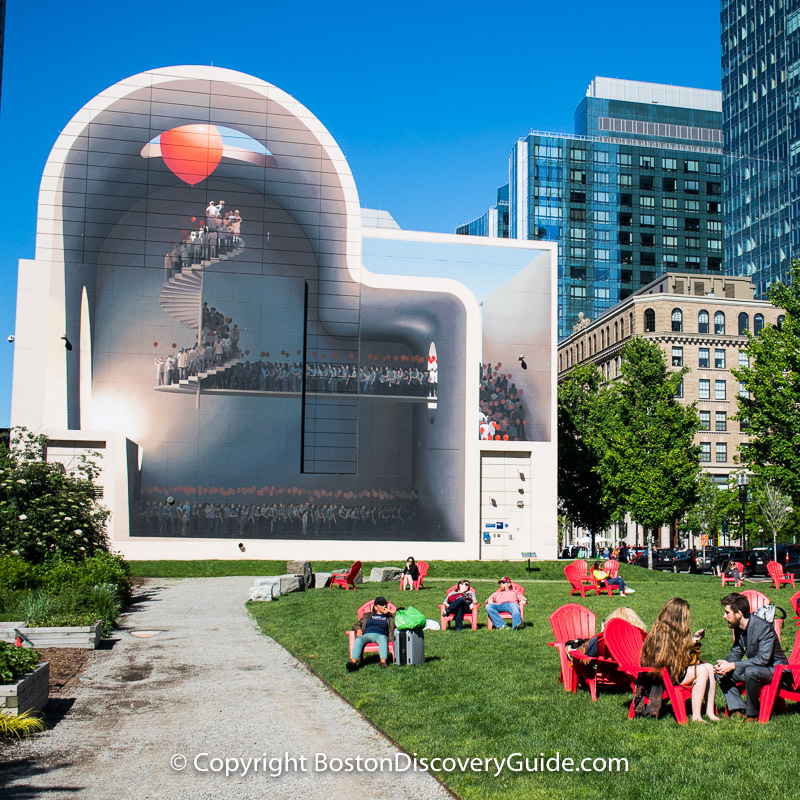 In a nod to the large community of artists who live and work in the nearby Fort Point area of the South Boston Waterfront, the Fort Point Channel Parks (located between Oliver Street and Congress Street and Atlantic Avenue, not far from South Station) feature revolving installations of public art, as well as bright red lawn chairs for relaxing and socializing. You'll also see other art installations by well-known and emerging artists scattered throughout other Greenway parks. Most up for only a few months - so enjoy them while they are here. 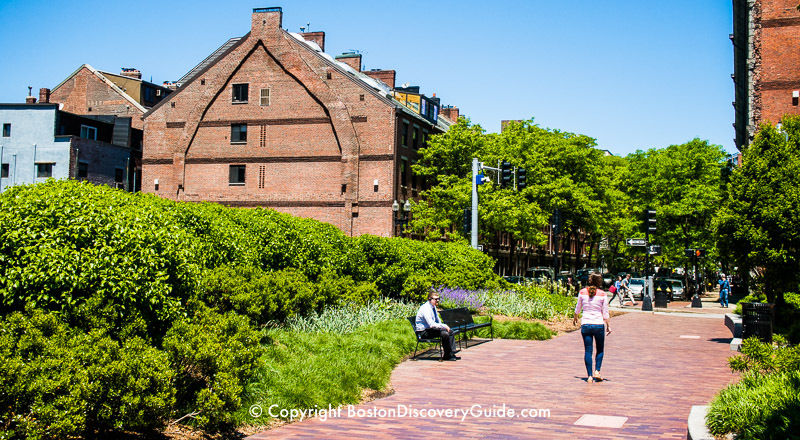 Since the Greenway cuts through parts of the city known for wonderful restaurants - the North End, the historic Boston bars and taverns along Union and Marshall Streets, Faneuil Marketplace, Boston Public Market, Chinatown - you're never far away from a tasty snack or meal. But you'll also find plenty of options right on the Greenway itself. Dewey Square Park, a mostly-cobblestone plaza between Congress Street, Summer Street, and Atlantic Ave between South Station and the Financial District, hosts a variety of food vendors from about 11am - 3pm Monday through Friday - during peak summer months, look for as many as 10 or more in the Plaza and maybe a couple more on Congress Street. On Tuesdays and Thursdays from May through November, 15+ vendors from Boston Public Market also set up a Farmers Market here. Greenway Carousel - Look for a couple of food trucks at midday - Cookie Monstah can frequently be spotted here. Rowes Wharf Plaza - Typically 5-6 food trucks park here at lunch time. Rings Fountain (Milk Street) - Usually two food trucks at midday. 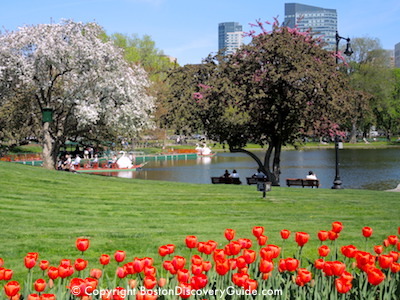 These hotels let you take advantage of being close to the Greenway as well as other nearby attractions - Faneuil Marketplace, the North End, Historic Downtown Boston, and the Waterfront - just to name a few! Sometimes the best activity to do on the Greenway is . . . nothing. 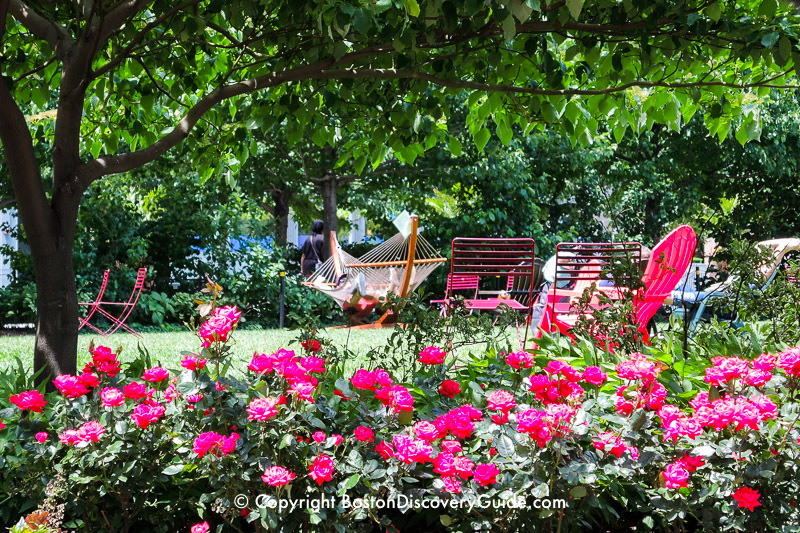 Find a grassy spot, throw down a blanket if you have one or just stretch out on the grass, and soak up the sun. 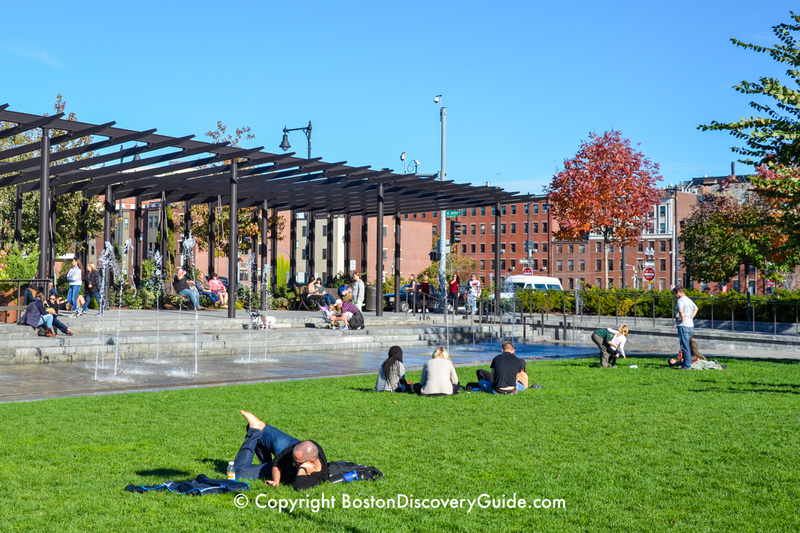 Bonus tip: Position yourself near one of the Greenway's fountains and enjoy the tranquil sound of falling water. Look at the Greenway from the air and you'll see a long, narrow ribbon-like shape chopped into small segments by city streets. 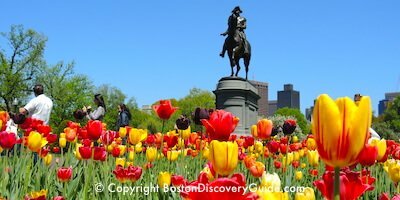 But explore it at ground level and you'll discover a series of unique parks filled with beautiful plantings, linked together by paths, stretching from the North End to Chinatown. 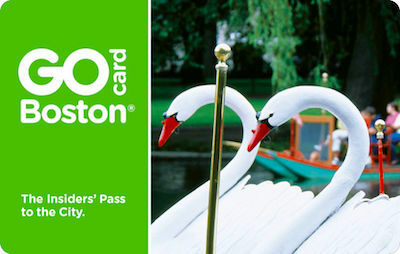 Save on Boston Attractions, Cruises, More with a Boston Discount Card! Best way to save in Boston. 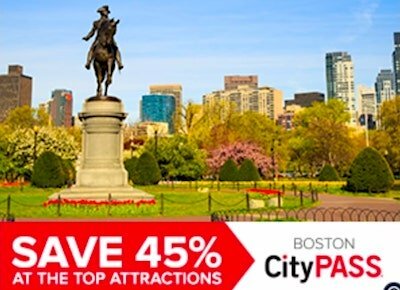 Save 50% or more when you visit the New England Aquarium, Prudential Skywalk Observatory, Fenway Park Tour, Boston Children's Museum, Plimouth Plantation, Museum of Science, cruises, and more. Compare to find out which one is best for you.